the glass surfacing veil, applied at the surface veil, applied at the surface against the gel coat, will greatly reduces the resin shrinkage at the surface during the curing process. A typical lamination process, whether in a open mold or closed mold application, would include a glass surfacing veil placed directly on a gel coat that is still tacky. Such a process in these common mold applications will improve that bonding between the gel coat and the reinforcement mat, will improve the strength of the gel coat, and will ultimately improve the profile by limiting the resin shrinkage, giving it a consistent, resin-rich surface. 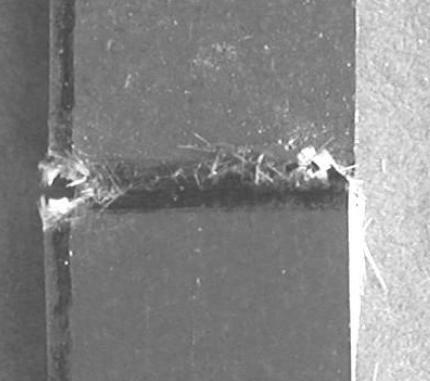 In this context, a consistent, resin-rich surface should not be compared to the term resin-rich when used in describing the behavior of resin pockets in glass reinforcement mat. As it pertains to a surface profile with gel coat, glass surfacing veil promotes a consistent resin-rich surface. 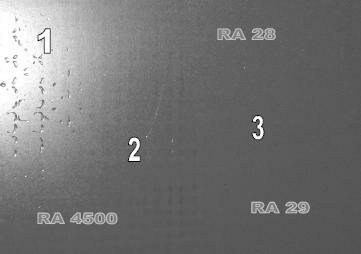 The dispersed filaments in the glass surfacing veil are loose and consistent compared to the glass reinforcement mat. These loose fibers will adhere to the gel coat more easily than the mat adhering to the gel coat. 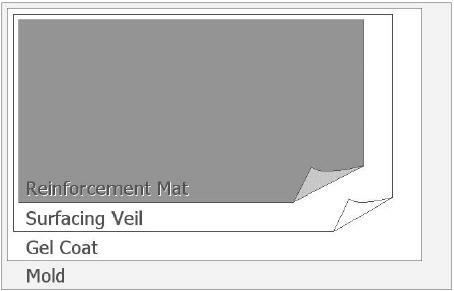 Likewise, the glass surfacing veil will adhere to the glass reinforcement mat better than the gel coat's adherence to the mat. Thus, the glass surfacing veil works as a go-between for the gel coat and the reinforcement mat. The bonding characteristic of glass surfacing veil leads to the next point. The surfacing veil will also reinforce the gel coat much like a mat will reinforce the resin. Two common attempts to improve a surface are to increase the amount of gel coat or increase the amount of resin. Increasing the gel coat in the absence of a glass surfacing veil will weaken the gel coat. Simply stated, this is because we have increased the distance of glass from the surface. Resin shrinkage is still an issue in this scenario, especially in a closed-mold situation. Increasing the resin will also weaken the surface of a laminate, allowing a greater distance between the surface and the important reinforcement glass. Plus the added resin will add to increased porosity and resin shrinkage. Again, the resin shrinkage is a greater issue in a closed-mold process. It should be noted, in a open-mold process, most of the resin shrinkage is away from the surface, as the styrene escapes through the path of no resistance. In a closed mold, the styrene is not allowed to escape as easily. As a result, the resin shrinkage is even, which includes the surface. Nonetheless, porosity and a weakened surface is still an issue when gel coat or resin is increased. An even 20 mil coat of gel coat is recommended. The variables of resin/glass ratio are too numerous to discuss here. These two image show six pieces of laminate that were subjected to a Charpy pendulum test. The tables above detail the test applied to this laminate. Specimens 1-3 shows how the gel coat maintained a clean break and did not fragment or shatter. Specimens 4-6 show a shattering of gel coat. This image is a closer view of specimen 2, a piece without surfacing veil. 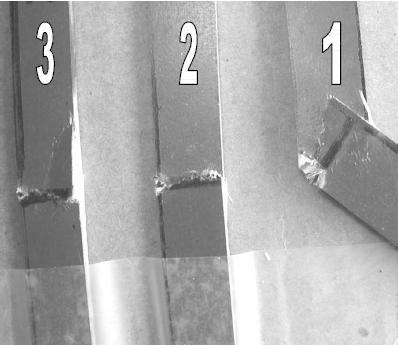 These images compare the behavior of gel coat in a test where a small piece of the laminate is broken. Specimens one through three have veil. Specimens four through six have no veil. This is a superb example of how the gel coat on this piece did not bond well to the reinforcement mat. Additionally, the gel coat lacked the reinforcement the veil provides on the following page. The peeling is because there was no veil to bond the gel coat to the mat. The shattering is because there was no veil to reinforce the gel coat. This image is a closer view of specimen 5, a piece with surfacing veil. 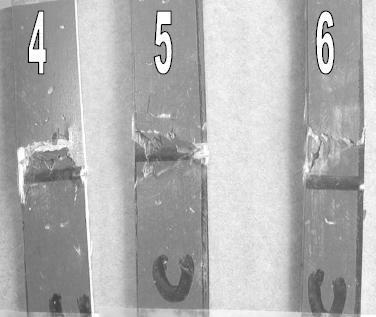 A considerable amount of force was used to break these samples. It stands to reason that on the above images, the gel coat shattered. With the surfacing veil adding bonding properties and reinforcement for the gel coat, the surface in this image took a clean break. Even in specimens one and three, although the break wasn't as perfect as the example, the breaks still show a clean break of the gel coat reinforced with the surfacing veil. Mentioning again, a glass surfacing veil promotes a consistent resin-rich surface. 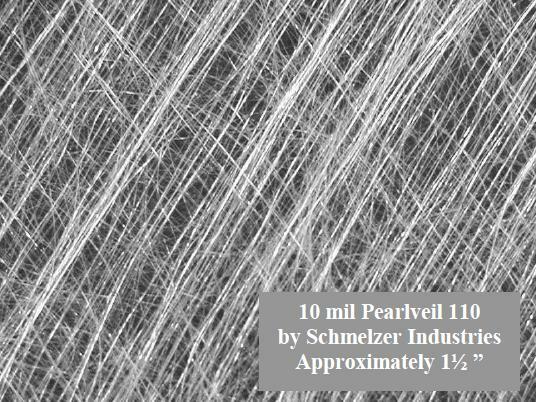 This resin-rich surface may be for a corrosion barrier, decreased porosity, or a class "A" finish. For whatever reason, a consistent resin-rich surface is obtained by excellent surface wet-out and limited resin shrinkage. A glass surfacing veil is the key to obtaining this consistent resin-rich surface. The loose web of individual glass fibers creates an environment where the resin flows quickly and evenly to the surface, and limits the resin shrinkage. This image shows the inside of the test laminate, looking through the test part with a bright backlight. The left half has no surfacing veil. The right side has a surfacing veil. 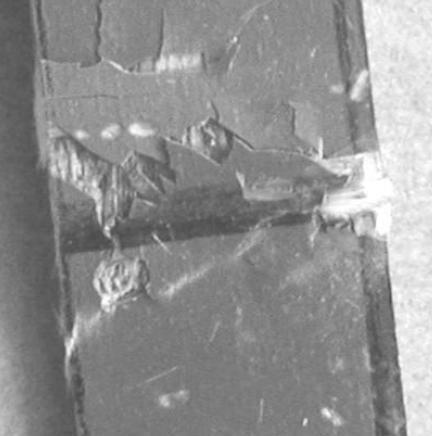 The left side, without the surfacing veil, shows the inconsistent resin distribution at the surface of this laminate. The irregular pattern of the woven reinforcement mat is obvious, showing the dark, thicker resin areas adjacent to the areas where the glass presses against the gel coat. consistent color and tone because of the resin distribution. The resin distribution contributes to the consistent resin-rich surface. The only irregularity seen here is from the loosely distributed glass fibers of the surfacing veil. This is what occurs on the inside of the laminate. The unveven distribution of resin affects the outside surface as well. Unlike the image on the above image, this same piece of laminate is photographed without the use of backlight. This view is of the outer surface only.  This image shows approximately 6" of the width. It should also be noted that none of these image have been "doctored" or altered in any way. In area 1 of this image, we see pitting, or alligatoring. This is because the resin did not wet-out or absorb well at the surface. The resin shrinkage caused the gel coat to pull away from the mold and sink into the rest of the glass. The pitting here has a pattern that is similar to the woven mat. The resin was not allowed to absorb into the areas between the glass. In area 2, also on the side with no veil, we see a similar phenomenon that we observed on the previous page. The pattern of the woven reinforcement mat is visible because there is no adequate resin absorption at the surface. Dark resin-rich pockets contrast the glass forced against the surface gel coat. This is not to say that these resin-rich pockets are absent on the side with no surfacing veil. molded part a consistent resin-rich surface. Areas 2 and 3 still appear to be smooth despite the pitting that occurs in area 1. Yet the issue of porosity is evident with further testing. The RA figures in yellow measure the profile more precisely than the detection of the human eye. A Profilometer was used to test the exact measurements of the vertical profile. The side with veil has two random measurements of RA28 and RA29. It should be noted that these figures are consistent with the intentionally matte finish. A matte finish was given to this laminate for the purposes of photographing this. The side with no veil had a measurement of RA4500. This is a sharp contrast to the side with veil. Simply stated, the side with no veil had resin shrinkage contributing to a roughness average 126 times greater than the side with veil. The RA figure is the roughness average as measured by a stylus profilometer. Each test area was approximately a square centimeter. Image the stylus, or needle, of a record player moving across a record. This stylus, in a similar fashion, is measuring the roughness of a square centimeter on the test laminate, detailing the roughness within 1/100,000 of an inch. In these tests, we observed visual and measurable differences to the behavior of gel coat when used with and without surfacing veil. The veil acts as a go-between, bonding the gel coat to the glass reinforcement mat. 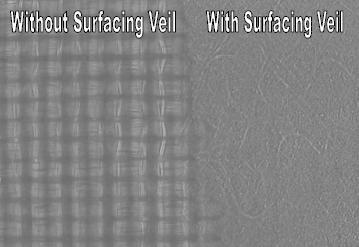 The properties of surfacing veil, with the loosely dispersed glass fibers, improve the adherence of the gel coat to the reinforcement mat. The veil reinforces the gel coat when applied to a gel coat that has not completely cured. In the same way a glass mat reinforces the resin, the fibers of the veil reinforce the gel coat. Most importantly, the glass surfacing veil improves surface profile, by correcting printout. The evenly dispersed glass fibers allow for easier resin absorption and distribution, and greatly limit the resin shrinkage. 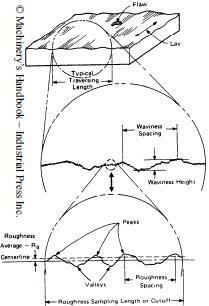 RA28 is an average roughness of 28/100000 of an inch, very minor compared to the average roughness of 45/1000 of an inch. Or in simpler decimal figures, .000028" compared to .0045". While to the naked eye there seems to be no visual evidence of resin shrinkage at the immediate surface, the Profilometer measured 126 times greater roughness due to resin shrinkage on the side with no surfacing veil, when compared to the side with surfacing veil. One half of the test laminate has surfacing veil applied on the gel coat, half of the test laminate does not have surfacing veil.